Follow our day to day activities during our missions. Today was intense. The post will be long. We were already feeling the fatigue of the week, but our alarms went off at 7:00 am, and we were divvied up into vans to make the 1-hour drive. We arrived and were directed to a courtyard with a cloth covering us, but all sides were open. We heard children giggling as we unpacked our supplies. They grabbed our hands, climbed on our backs, hugged our legs, and slightly failed the marshmallow test (google that). The pediatricians decided it was time to take control. Bouncers were designated for crowd control, a triage system was instituted with volunteers performing registration, and the square was divided into "teams." We set up our supplies in the middle, because if we put them too close to the edge, the gloves suspiciously disappeared. And thus we began. No bathroom breaks, no food breaks, and us chugging our water bottles to use them as spacers. When we finally made it through every single child in the camp, who all surprisingly had a fever and needed paracetamol, the fun began. One pediatrician began the infamous Glove-gate. She wanted to be kind and gave some left-over gloves to a few boys who had asked her for them. Much as pigeons swarm when bread is scattered, the children flocked. Children lined up front, asking for gloves. The gloves were turned into balloons, and the kids used them as toys and shrieked with glee as they managed to convince someone to give up their used gloves. Some children asked to be thrown in the air, one girl climbed on the back of a doctor and wanted a piggyback ride, and another doctor was busy playing with an unbelievably cute baby on the sidelines. There was joy. Everywhere. Giggles. Laughter. Singing and games. Her first patient came in with a stack of papers. Through some translations and back-and-forth, the interpreter-doctor team slowly learned that the patient had recently been diagnosed with glioblastoma multiforme grade IV, with metastases. The dad came, not to learn more about the diagnosis or treatment, but to beg for help with affording palliative care. He was unable to afford the drugs necessary to treat pain and felt helpless. And similar our colleague began to feel helpless too. The emotions were intensified when a family came in with their 8-year old who had a possible myelodysplastic syndrome and could not afford his bone marrow transplant. They desperately asked if ‘the American doctors could take their child with them abroad for treatment.’ It is a very difficult thing, when you have been trained to do ‘all you can do for the patient’, to settle for less. You feel useless as a doctor when you cannot offer what a patient needs or even point them in the right direction. You learn to offer whatever help you can, but you cannot deny your feelings of hopelessness. Our group of doctors: internists, ED docs, PEM docs, IM and cardiology docs, translators, volunteers, and pharmacists all sat around tonight with this shared heaviness, with a bizarre dichotomy of nearby wedding music, as we finally had a few minutes to process our week. So we did what we could to process, and then danced and laughed with the wonderful humans who spent the last few days sharing this experience with us. The highlight was when we crashed the wedding, danced with the bride and groom, and then were given slices of the wedding cake. We have truly been blessed. Not all people are. Our mission is to provide compassionate medical care to refugees and vulnerable host communities. 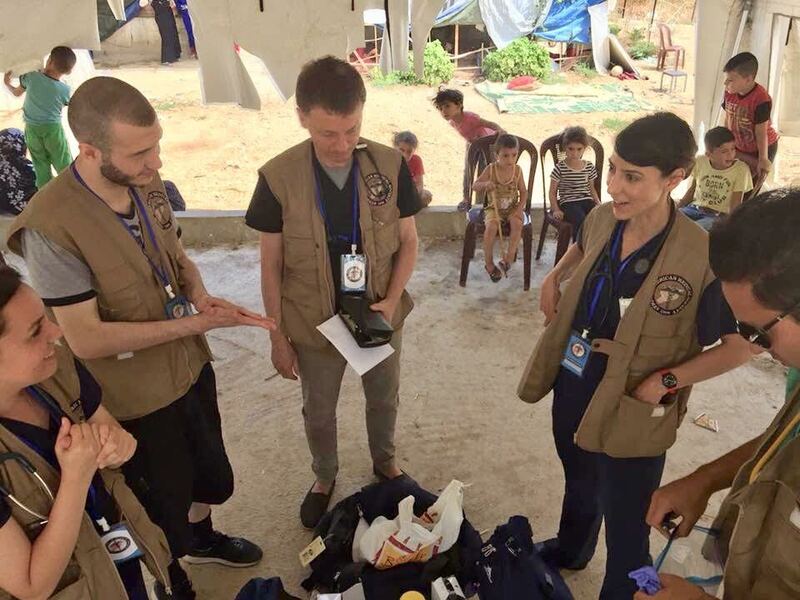 Our multi-disciplinary group of doctors from New York, Denver and Houston collaborate with international NGOs such as the Syrian American Medical Society (SAMS) to bring together a relief effort centered around health, prevention and education.